Newcastle United manager Alan Pardew has backed the appointment of Derek Llambias as chief executive of Rangers. Llambias, who was the managing director of Newcastle, was named Ibrox chief executive on Friday. "He took this club when it was paying a lot of money that was going to waste, and it ended up with a relegation, and then managed to get them out of that division," Pardew said. "He was a big part of that and will bring that experience to Rangers." 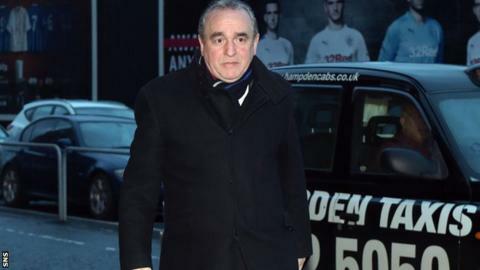 Llambias joined the Ibrox club as a non-executive director in November, after Newcastle owner and Rangers shareholder Mike Ashley agreed to loan the cash-strapped Scottish Championship club £2m. Pardew added that Llambias, who left United in 2013, helped "stabilise" the club in the English Premier League after they were promoted from the Championship. "In the position Rangers are in at the moment, he's probably well-armed to do that," said Pardew. "Derek is an experienced chief executive, I wish him luck." Ashley owns around 9% of the Ibrox club and has an agreement in place with the Scottish Football Association that he will not increase that to above 10%. He and Rangers are to appear in front of the SFA in January, however, having been accused of breaching several rules regarding Ashley's role at Ibrox.